When I discovered how easy it is to make taro cake (link here), it only made sense to try turnip cake next. This is very similar to the dim sum they serve in the restaurants. Personally I like turnip cake much more than taro cake. I revised this recipe and improved it for Chinese New Year, February 2011. (The original photo that was posted is at the bottom of this post.) If you have leftover daikon radish, see here for a list of other recipes. Place the shredded radish and water (or chicken broth) in a pot and bring to a boil over high heat. Then reduce the heat to low and maintain a simmer for 15 minutes, covered, stirring occasionally. Remove from heat. Place the radish (reserve the cooking liquid) in a large measuring cup. Top it off to 3 cups with the remaining cooking liquid. Set aside and allow to cool slightly. Meanwhile, heat the oil in a skillet over medium heat. Add the lap cheong, mushrooms, and dried shrimp. Stir fry for 2 minutes, stirring frequently. Then remove from heat. Alternatively, you could throw the dried shrimp in with the water when cooking the turnip. Prepare the steamer and bring the water to rolling boil. (Here are detailed instructions for how to steam cook food.) In a large bowl mix together the rice flour, salt, sugar, and white pepper. Add the radish and cooking water and stir until well combined. You will have a batter that should not be watery or too thick. You can adjust the rice flour and water here to reach the desired consistency. The more rice flour, the more dense the turnip cake will be. Add the lap cheong, dried shrimp, mushrooms, and green onions to the batter and stir to combine. Pour the mixture into a lightly greased 9 inch round glass dish or cake pan. (Note: I’ve also seen people use loaf pans. This allows you to control the thickness of your slices and gives you perfectly even pieces of turnip cake. If you use a loaf pan, increase the steaming time.) Place the dish into the steamer, and steam for 30 – 40 minutes. The turnip cake will be done when an inserted toothpick comes out clean from the centre. Also, the turnip cake will be very hot to the touch. Do not overcook. Remove the turnip cake from the steamer, place the dish on a wire rack and let cool before cutting into slices. I like to serve this warm after steaming with sweet soy sauce. Alternatively, you could pan fry these slices in oil in a skillet and serve hot with sweet soy sauce. 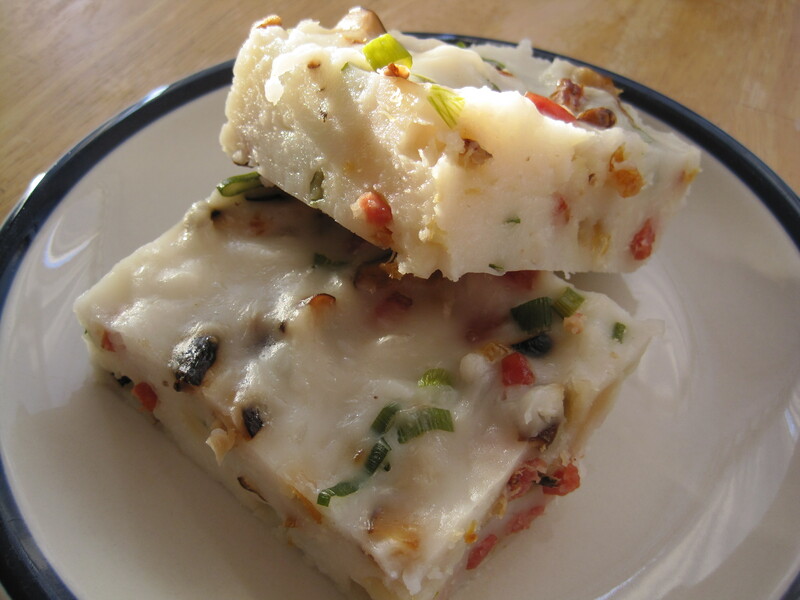 Slices of turnip cake can be frozen and reheated in a steamer or in the microwave after being defrosted in the fridge. Hurray! 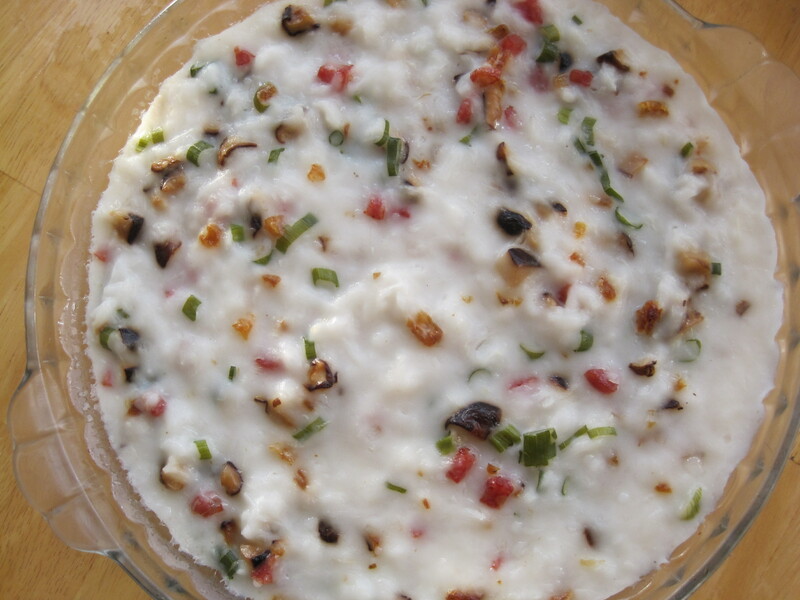 I love lo-bak-goa, but all the recipes I’d found were too intimidating (read: I’m too lazy). : ) This is much more approachable — thanks for posting it! Hey! I’m so glad 🙂 Let me know how it works out for you! If you have to steam 30 – 40 minutes, does the water steam out and you need to add more water? Do you boil the water first then add it? Thank you for your questions! Yes, bring the water to a strong boil first. Then place your turnip cake into the steamer. You can reduce the heat slightly but make sure that the water is still boiling the whole time. And yes, you will need to check on the water levels every 10 to 15 minutes. My wok is quite wide and my steamer rack is tall enough so that I didn’t need to refill the water. Do not let the wok burn dry or your wok may get damaged and your turnip cake will smell and taste burnt (from personal experience making something else haha). I love lo bak go! Thanks for the recipe! I can’t wait to try it for CNY!! Yum! Thank you so much for your comment! Be sure to keep your eyes open for the Baked Chinese New Year Cake recipe that is coming out soon 🙂 Happy New Year! 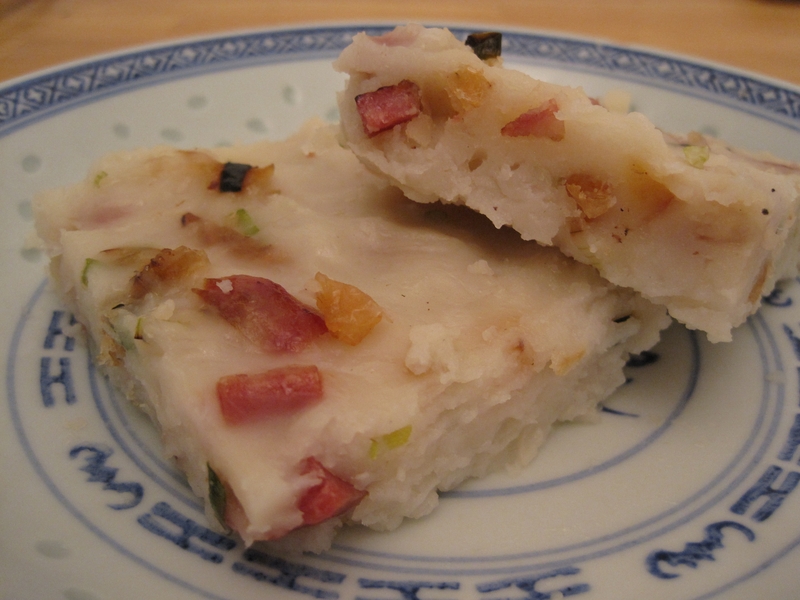 Is it possible to prepare the turnip cake via baking instead of steaming? Hi Christina, Thanks so much for your question! Although you could bake it to cook it, baking it would result in a dry and possibly brittle turnip cake. Steaming keeps it soft and moist. If you do try baking it, let me know how it turns out! Thanks again!